The Hope & Optimism Portfolio - What is an Original Print? An original print is the image on paper or similar material created by one of the basic processes described below or by a combination, such as a silk-screen and etching print. Each medium has a special identifiable quality but because more than one impression of each image is possible, original does not necessary mean unique - a print can be an original (like a 'one-off' oil or watercolour) while being a multiple at the same time. 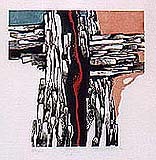 With monotype and hand-coloured prints and sometimes with collage prints each work is also unique, being different to all the other prints in the edition either in image (monotype and collage) or colour variation (hand coloured). Until recently, the debate on originality in print-making was confined to the broadening of the concept of a print to include the results of collaboration with master-printers, of photography and of the rejection of reproductions. The rapid technical advances of printing, including computer-generated images and DTP have meant further re-evaluations. The Printmakers Council of Great Britain suggested that: 'The artist printmaker has the inalienable right to decide himself on the methods he uses to make a print ... His work can be executed by himself in his home alone, or with the help of assistants, or he can work elsewhere in a workshop, or with technicians or in a printing works. His work can be entirely executed by a third person ... and he must show approval by signing the print.' 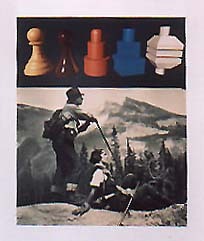 On the role of master printers and artists, Pat Gilmour remarked: 'Despite this interdependence (artist and printer) ... the fact that without such a partnership some of the most successful prints in the world would never have come into being, history has a way of recording and remembering only the name of the artist. Today the key to the originality of the finished work is the artist's intention. When the artist's intention is to reproduce an existing image, and not to vary it or adapt it in any way and, secondly, do so by photo-mechanical means then this is a reproduction. Such prints are usually editioned in large numbers and remain unsigned. The image choice will usually but not necessarily determine the technique of graphic expression. The artist might adapt a subject matter from a previous work or create an entirely new image - the subject matter usually determines the medium that the artist would like to use. In all cases the artist will alter the image as it progresses, adding or removing parts or changing colours. Once satisfied with a final proof of the edition, the artist will then complete the edition and sign and number each image, sometimes titling and dating them (as with water colours or oils). The plates or blocks which were used to create the image are cancelled (usually with two parallel lines in the top left and bottom right hand corner). Where a master printer is the printer and not the artist, the artist and the printer will work in consultation. The degree of involvement of the artist varies from artist to artist and from printer to printer. However, once the artist is satisfied with the final proof he marks it 'BAT' and signs it, thereby indicating that the edition may now be completed and the same system as with the artist as printer of signing and numbering and cancelling is followed. Below follows a brief discussion of a number of techniques used by several artists in the Hope and Optimism Portfolio. The examples given are from the Portfolio. Made by cutting into the broad face of a plank of wood, usually with a knife. The artist cuts away areas not meant to print. These cut away areas appear in the finished print as the white parts of the design while the ink adheres to the raised parts. As with the woodcut, but -obviously- the cutting is done in linoleum, rather than in wood. A metal plate is coated by a material which resist acid, called the ground. The artist then draws his design on the ground with a sharp needle which removes the ground where it touches it and when the plate is put in an acid bath, these exposed parts will be etched (or eaten away). This produces the sunken lines which will receive the ink. In printing, the ink settles in the sunken areas and the plate is wiped clean. The plate in contact with damp paper is passed through a roller press and the paper is forced into the sunken area to receive the ink. The depth of the tone is controlled by the depth of the etch. A copper plate is protected by a porous ground which is semi-acid resistant. The white (non-printing) areas, however, are printed with a wholly acid resistant varnish. The plate is then repeatedly put in acid baths where it is etched to differing depths. The final effect is an image on a fine pebbled background (imparted by a porous ground). Aquatint is usually employed in combination with line etching. The artist draws directly on a flat stone or specially prepared metal plate (usually with a greasy crayon). The stone is damped with water, then inked. The ink clings to the greasy crayon marks but not to the dampened areas. When a piece of paper is pressed against the stone, the ink on the greasy parts is tranferred to it. The artist prepares a tightly stretched screen, usually of silk, and blocks out areas not to be printed by filling up the mesh of the screen with a varnish-like substance. Paper is placed under the screen and ink is forced through the still open mesh onto the paper. A photograph that is editioned, signed and numbered like graphic prints is generally considered today as part of the print mediums available to artists, especially when a creative process occurs in set-up and/or development of the image. Another new medium available to the artist is the computer. As with the photograph, the computer generated image will show evidently the creative input of the artist and is editioned, signed and numbered. The image can be produced in another medium once it has been created on the computer, as Leon Golub did in this example.